played on Saturday, 24th August, 2002 at 3 p.m.
For space reasons, some photos of this game have had to be removed from this page. If you wish to see them, please e-mail me, quoting the file name of the page in question. After two 4-0 defeats, Altrincham were looking to start a climb up the table from bottom position. Hucknall had drawn their opening two fixtures. The Watnall Road pitch looked in much better condition than last season and a new sloped terrace had been added behind one of the goals as Alty fans received their customary friendly welcome to Hucknall. Hucknall's Mark Nangle will probably never score a simpler hat-trick as Altrincham conceded four soft goals to his side this afternoon. Alty keeper Stephens missed a corner ball after just three minutes to set Nangle on his way and then a huge gap in the Alty defence allowed in Scott Huckerby for the second (21 mins). As at Vauxhall on Tuesday, Alty improved and dominated the first half-hour of the second half, grabbing their first goal of the season through Gary Talbot after 61 minutes to make it 2-1. Gary's headed goal from a Ryan free-kick is seen above; he is the farthest right Alty player behind a defender. Alty looked like getting an equaliser but an overhit back-pass by Neil Murphy caused problems for Stephens and ended up with a tap-in for Nangle (81 mins) to put the match out of reach. Then, a minute from the end, a huge "up and under" was dropped by the keeper to allow Nangle to complete his hat-trick. There were two changes in the Alty starting line-up from that defeated 4-0 at Vauxhall Motors last Tuesday. Ryan Hevicon has apparently been released from the club, whilst Chris Adams was also out, presumably injured. Into the team came midfielders Ian Craney, who had missed the last game through injury, and Neil Ryan, back from his summer break for his first game of the season. On the bench, there was no place for striker Mike Turner and into his place came Sean Smith, from Cheadle Town, who had previously appeared as a full-back substitute in pre-season. As on Tuesday, this game was preceded by a minute's silence (seen above) for the murdered Cambridgeshire schoolgirls, Holly Wells and Jessica Chapman. Within thirty seconds of kick-off Alty keeper Nick Stephens was in action, catching a cross by McGowan, from the left. The keeper's punt upfield then ran off Young for a Hucknall goal-kick, taken by the Hucknall player/assistant manager Steve Prindiville. In fact, the home keeper Ryan Young took no goal-kicks during the game. Just as Alty fans were noting that their side had lasted longer without conceding a goal than the 62 seconds that elapsed before Vauxhall's first goal last Tuesday, Hucknall took the lead in the third minute (see photo, right). After Talbot had done well to break up an attack by heading the ball out for a corner, the resulting flag-kick completely evaded Nick Stephens's jump and fell to Hucknall's Nangle at the back post. He turned the ball into the net without much difficulty. For the third match running, Altrincham were chasing the game. McGowan continued to cause problems up the left wing as Altrincham remained on the back foot at this stage. Alty's best early effort was a 25 yarder from Thornley, who had received the ball from McDonald via Craney (11 mins). Mark Maddox, (seen competing with Mark Nangle, left, in today's game), in particular, was being called into frequent action at the other end, making repeated headed clearances off his lines. Although the pitch looked in excellent condition, it was bobbly in places and this did not help the sides to play a passing game, though Altrincham seemed to find this more difficult than their hosts. Thornley then had another long range pot at goal which passed over the bar (18 mins) before a good Hucknall move up the left ended with Huckerby's low, firm cross, which the diving Stephens saved well as it flashed across his goal area (20 mins). As Alty's performance began to look a bit more promising, Thornley executed a neat turn and shot but Ryan Young saved his effort. Play immediately switched to the other end and the ball found Scott Huckerby in acres of space in the inside left position. As the exposed Stephens came out to narrow the angle, Huckerby expertly sidefooted the ball past the keeper's left hand to double the Hucknall lead (21 mins). Thornley soon got the ball to McDonald whose superb strike from 20 yards was only inches wide of the target to the keeper's right (26 mins). 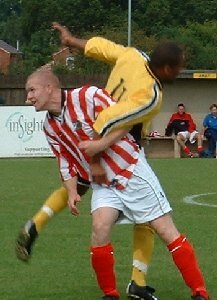 Hucknall responded with a freekick by the influential player-manager Phil Starbuck, which Stephens punched out for a corner. Starbuck's corner was missed by the Alty keeper and Steve Lenagh sent his resulting header against an upright (28 mins). As Hucknall continued to press, Ian Craney went down injured and had to be taken off. It appeared to be a recurrence of his thigh injury and Alty physio Anne-Marie Jones put him through some stretching routines as he lay prostrate, off the pitch (32 mins). Jason Gallagher came on for Craney (34 mins) and slotted into right midfield, with McDonald moving inside. Almost immediately McDonald fired in his second long-range shot of the game, this one being only just too high (35 mins). Altrincham were now matching the hosts in forward movements but apart from obliging Ryan Young to punch a ball clear, they did not create any clear chances at this stage. Gary Talbot then committed a foul and was booked (37 mins) before a Hucknall long shot was comfortably fielded by Stephens (38 mins). Thornley, who was working as hard as usual in the Alty attack, then won a corner on the right with a deflected shot. From the corner, Talbot rose well but his goalbound header was cleared off the line by a defender (41 mins). After a foul on Gallagher, who started to have some impact on the right wing, Ryan's dead-ball kick was cleared. Just after the "two minute" board was shown, Hucknall won a corner but Starbuck and Mitchell's short-corner routine came to nothing. The half ended with Alty two goals down but they had had plenty of the ball and gone close to scoring on several occasions. As in the previous games last season, some promising play had been undermined by slack defending early in the game. Hucknall made a double change at the interval, Cooke replacing Lenagh and the tall Ricketts coming on for Huckerby. Almost immediately a Woodford cross found Gallagher on the right in the box and with the help of Thornley, Young got in a shot that was blocked for a corner. This had been Alty's nearest yet to a goal from open play (46 mins). Alty proceeded to have the better of the next 20 minutes or so. Ryan Young had to be smart to kick the ball off Thornley's foot before Young and Gallagher combined down the right and from the latter's cross, a flashing header from Thornley found its way into the keeper's arms (54 mins). Alty then replaced Woodford by Stephen Rose, who went to left-back to replace Scott, who in turn moved to left midfield (56 mins). Thornley and Gallagher looked the most potent Alty threats at this stage but a Rose cross also gave Young a chance but he shot wide (59 mins). Thornley was then tripped to earn a free-kick in the left corner. This was taken by McDonald and came back to him. For the third time McDonald showed a willingness to shoot from distance and his left foot shot was not too far wide (60 mins). As the Hucknall defence continued to be pressurised it conceded another free-kick by felling Young. This kick, from about 20 yards out, on the left, was taken by Ryan. Gary Talbot rose well near the back of the goal area and firmly headed the ball home for Altrincham's first goal in four hours of football this season (61 mins). Almost immediately Hucknall conceded another free-kick for a foul on Thornley but Ryan's shot from the free-kick went over the bar (63 mins). Hucknall shored up their defence by replacing Hicks with Brown (4 mins) as Altrincham looked a good bet for at least a draw. Thornley again sparked some action and the ball came back to him via Rose and Scott. Rod drove in a superb curling shot from just outside the box, to the left of goal, which shaved the Hucknall post to the right of goal (66 mins). Then Maddox obstructed Cooke and was booked but Starbuck hit the free-kick from 25 yards over the roof of the Doff Portland Stand behind the goal (68 mins). Alty's Stephens had been a virtual spectator in the second half. On a rare Hucknall attack, Mayman went down on the edge of the box but referee Sarginson gave the free-kick to Rose and persuaded the otherwise impressive Hucknall right-back to get up rather than continue to lie "injured" on the ground. However, after Alty had dominated the preceding twenty to twenty-five minutes, Hucknall began to get back a little more into the game. Nevertheless, Gallagher soon had a great chance, coming into the box from the right, but he hit his shot well over the bar (75 mins). Young, Gallagher and Thornley then combined for a shot by Neil Murphy, (pictured right during today's game), which also cleared the bar from 20 yards (78 minutes). Another good chance came for Alty when McDonald, Ryan and Rose combined and Rose's cross found Young inside the box. The burly forward chested the ball down well but was unbalanced by a challenge and another good chance went wide (80 mins). As in the first half, from a good Alty chance at one end, a Hucknall goal soon followed at the other. This time, Neil Murphy overhit a back-pass to Stephens who consequently could not get a clean kick on the ball. He found Maddox, however, but the defender was unable to hold off a challenge from Cooke, who slid the ball across goal to the right where the unmarked Nangle slotted the ball home from close range at the back post to put the game out of Alty's reach at 3-1 (81 mins). Alty nevertheless won a corner from which Maddox's shot was deflected out but the referee gave a goal-kick. Mayman then whipped in a fast cross from the left which Cooke headed well, but just over the bar. Stephens put the resulting goal-kick straight into touch, for the second consecutive time. Murphy next committed a fairly average sort of foul but got booked for it (85 mins). From Starbuck's free-kick, Ricketts hit Stephens's right upright (86 mins) and another Hucknall corner soon followed, as the "three minutes" board was displayed. This corner in turn led to another, which was cleared. Then, an extremely high, speculative ball was pumped into the outer edge of the Alty penalty area from somewhere near the centre circle. Stephens came out to catch but sadly got a little underneath the ball and it spilled out of the young keeper's hands behind him, leaving the challenging Nangle with the simplest of tasks to complete his hat-trick (89 mins). With the Hucknall crowd in raptures, the Alty team left the pitch at the final whistle to contemplate a performance which in many respects had been promising but which had been undone by a series of defensive lapses. Also, although Alty had plenty of near misses and showed plenty of effort especially in the second half, there is room for improvement in the midfield and forward areas as well. Manager Bernard Taylor and coach Andy May have few options in their small squad to change the existing team so it will be a matter of re-grouping and re-motivating the same players for Monday's basement battle at Moss Lane against our equally point-less visitors, Gateshead. At least Peter Band will be available after suspension but Ian Craney's injury must make him a doubtful starter on Monday.